We started building our garden in May 2009. In June we got extra motivated to make it our dream garden. I asked Keriann to marry me and we decided to get married in the garden! We are amazed about the end result. Our plans to make a garden started with some hop's root cuttings which we found in the fridge of our new rental house in Brightwood, VA early spring this year. The owner of the house bought them for us as a gift: "nice trial to see if you can grow organic hops in VA" apparently hops need an 18 feet high trellis to grow on… The scarlet runner bean is definitely our best climber of the season. It was showing awesome purple flowers/beans on our wedding day. This looks like an amazing place to visit! And I bet it&#x27;s a lot cheaper to fly to Virginia than it is to Holland! I like a gardener who builds an 18&#x27; high trellis for a specific plant! Looking forward to seeing pictures of this garden next season... should be quite a cool space. Next season it will be even more pretty, I will plant in december the garden full with tulips and some other flower bulbs. This spring our garden will be open for public. There will be a pick your own tulips field as well! My dream is to bring a little bit of Holland to Brightwood,VA! What a great plan, and beautiful garden! I love the trellis and stone path! 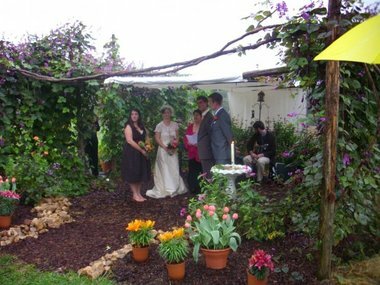 How wonderful to get married in your personalized garden...so happy for you both! Can&#x27;t wait to see more! <br/>PS - if the hops had been successful, what was your plan...homemade beer?!?!? YUM!! Wow, that was a quick transformation! Beautiful garden! I love garden weddings!